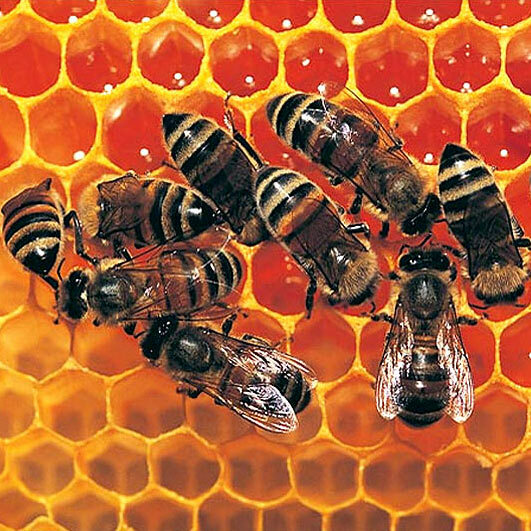 The queen bee is fed Royal Jelly throughout her life and lives 12 times longer than her workers. This natural miracle has numerous health benefits, and the added Ginseng extract gives you that little extra daily buzz! Royal jelly is nutritionally very rich, containing rare B-complex vitamins, pantothenic acid (vitamin B5), vitamin B6 (pyridoxine) and amino acids. Royal Jelly also contains many trace minerals, enzymes, antibacterial and antibiotic components, and even vitamin C. Royal Jelly has long been considered an immune system booster, and has recently been reported as a possible beneficial agent in Graves' disease. It has also been reported to stimulate the growth of glial cells and neural stem cells in the brain. There is also evidence that it may have some cholesterol-lowering, anti-inflammatory, wound-healing, and antibiotic effects. Research also suggests that the 10-Hydroxy-2-decenoic acid (10-HDA) found in Royal Jelly may inhibit the vascularization of certain types of cancer tumors, but this is still conjecture at the current time. In alternative medicine, Royal Jelly is believed to have anti-aging properties stemming primarily from its amino acid content and broad spectrum of vitamins and minerals. Its reputation for aiding libido and fertility is also well known. Royal Jelly is also widely used as a component in skin care and natural beauty products. Royal Jelly (And pollen and honey based products in general) have been said to help allergy sufferers when taken long term. If you are allergic to bee products, please consult your physician before using. We combine our Royal Jelly with Korean (Panax) Ginseng extract , meaning you get the added boost of Korean (Panax) Ginseng root 5:1 strength extract. Ginseng is a potent stimulant, like coffee without the caffeine, and also has potent adaptogen effects. An adaptogen is a flexible substance that the body can use and transform in to many different compounds which it may be lacking in. Studies have shown that a daily dose of Ginseng positively affects both energy levels and mood, and increases the quality of a persons life.